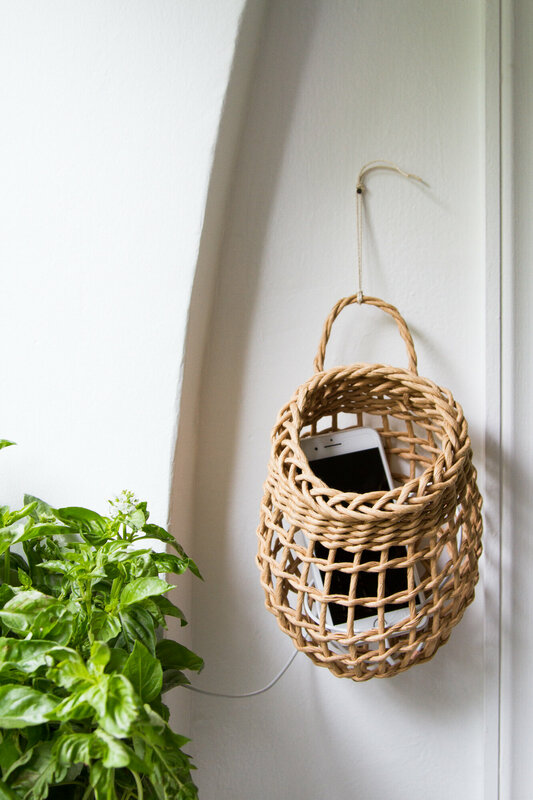 Tip #170: Put your phone in a basket. Knowing this about me, people often ask how I cope with kid clutter. Brushing off the gendered hint of mom shaming, I’ll say that it mostly doesn’t bother me terribly but also that we keep a small number of toys, that we encourage our kids to play with just a few things at a time, and that we coax them to clean up as they go. My kids are pretty good about putting their toys away. And pretty good about bringing them back out again. I’m pretty good at embracing temporary messes as part of the package. Sometimes I step on a tiny block and swear a whole bunch, but I still love my kids. What drives me crazy in a small space is not the kids’ toys. It’s phone cords. Why are they always around and why can’t they make themselves more scarce? Bear with me. I generally discourage organization tactics that rely on buying one sized-to-fit solution that works for awhile but that eventually just accumulates dust or falls out of favor. When I’ve tried to wrangle cords in the past, I’ve mostly done so by tying up extra length of cord and keeping things as tidy as possible without buying (or making) anything specific. This works quite well until it doesn’t. The thing about phone cords is that they always need moving. We take them to work, we bring them on weekends away, we move them to a different outlet if we’re out of battery and need a quick charge and also need to put our feet up. Even if you’re lucky enough to have more than one of them, chances are that your phone cord is not a static item in your home. As soon as you wind up your cord and stash it neatly, it needs unwinding again. I wanted something tidy, but flexible. Pinterest abounds with DIY solutions for phone charging stations. Most of them are large. Many of them are ugly. Nearly every single one takes up precious real estate on counters or tables. Not so with the garlic basket! 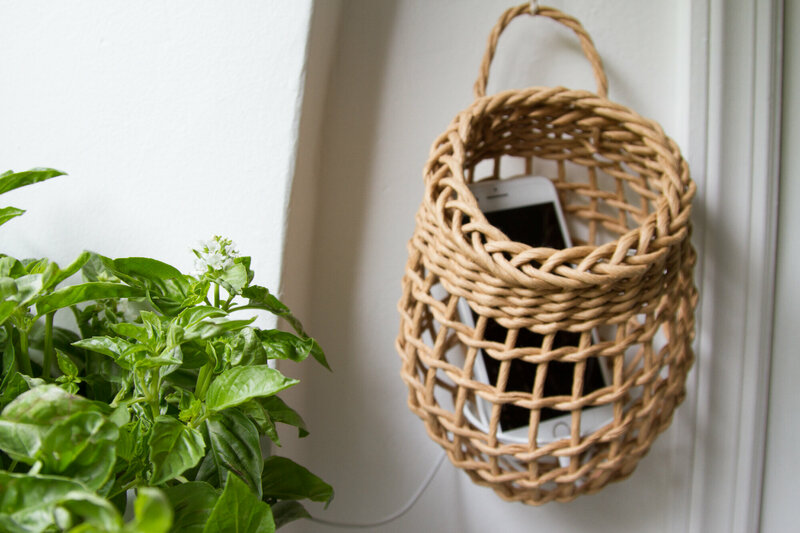 How do I love my garlic-basket-turned-cell-phone-charging-station? Let me count the ways. It’s pretty. It can be useful beyond stashing a phone should we ever live in a world where these things don’t require a cord. A wide weave means that options for snaking wires and plugs abound. And there’s plenty of room for more than one phone and cord. It’s a family affair. 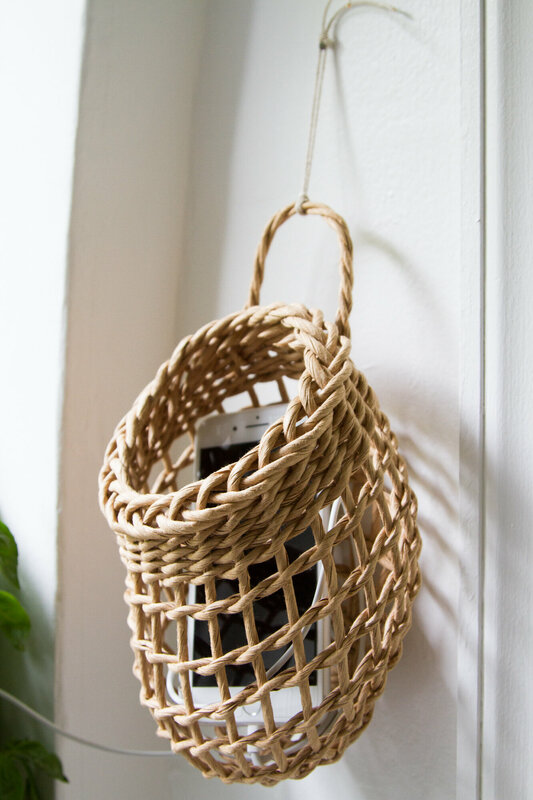 James and I both keep our phones in this basket which means we always know where our phones and cords are and when we do need to make off with a cord and its plug, that’s easy too. I realize this is somewhat more prescriptive than lots of my small space tips. By all means, ignore it entirely if you already have a wonderful solution that works for you (do tell!). 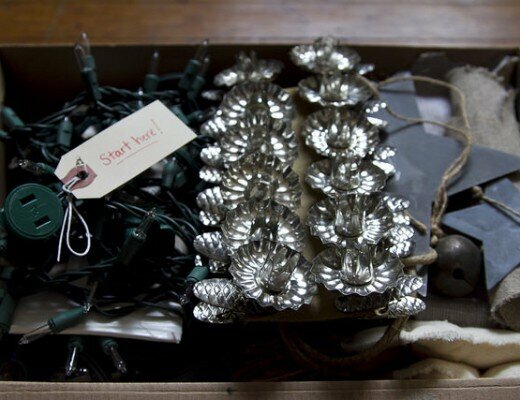 But in case you find yourself with phone cords and their attending phones that sit in your stand mixer, or snake across your drying dishes, or gravitate to the small pool of water on the kitchen counter, and generally haunt you from across the room, perhaps this tip will provide some tidy encouragement. * I bought this garlic basket in the custom elephant garlic basket size to accommodate our large cell phones! If you decide to go this route, take a look at the measurements and decide what would be right for you! 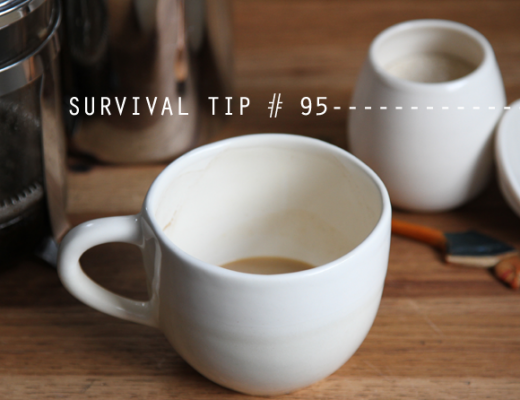 Tiny apartment survival tips #1-169. Oh my, great timing! I have been contemplating this exact small space issue in tandem with a desire to move our phones “main” charging stations out of our bedroom for the past few weeks. This would look so much nicer in the living room than charging stands and whatnot! Thank you! I LOVE this idea! I have a couple of these baskets lying around after we moved from a home where they made more sense for our garlic needs and have been wondering how to use them again (and how to keep phones off our counters). You have me intrigued re the mom shaming kid clutter bit though – IS it mom shaming? I feel like it’s just a thing all parents deal with, and since you have a blog with an organizational bent and also happen to be a mom, you’re a go-to treasure trove of answers (is what we all hope, anyway). Though now I wonder if a dad with a blog on simple living would be asked that as often…I don’t know. Probably not? Is that what you meant? Ha! Don’t get me wrong: I clearly *love* chatting about organization wins! Definitely true that no one ever asks James how he deals with the kid clutter, but more to the point, they don’t accuse him of quashing his kids’ creativity by asking them to clean up after themselves! (Jeez!) Totally understand that it’s most often normal curiosity (even solidarity!) that sparks questions around kids and small spaces—and I’m so happy to answer them!—but it’s also interesting to me to notice that they’re often posed as a challenge. Or a gotcha? Have definitely noticed this tone in some comments. I think that too there’s an implication in some that organized minimalism is being forced upon children, or is Erin’s need rather than theirs, or is just about achieving aesthetic perfection (and instagram-worthiness) rather than freeing kids from stuff. I also observe an occasional hope that it will backfire, and that the minimalist will (horrors!) succumb to the allure stuff! I see a similar dynamic in discussions of gender and childhood. I’m constantly confronted with people who pat my back at my attempts to limit gendered language/play for my young children, noting that soon the girls will just want to be princesses and the boys will like trucks. It’s a strange response. If it were true (and I don’t believe it is), am I supposed to just capitulate from the beginning? Is it not possible that the home might persist as a simple space? or as a non-gendered space? And are we to give up on the hope that our own actions/parenting might shift social norms? Just sighed the biggest breath of relief reading this. Agreed entirely. Here’s to divergent paths in all their many forms! Oh yes – I see. That makes sense. As someone who is on board with minimalism and less stuff for kids for their own sakes (as well as ours) I forget that there are folks who see it and speak about it in a different light. Thanks for taking the time to respond, Erin and Helen! “the home might persist as a simple space” – Well said! Lovely solution! I have a rickety old bookshelf and the gap at the corner of the shelf is just right for wedging in the cord, waiting for my phone on a tray on that shelf. Three cheers for satisfying and specific solutions! Ha! Yes! Satisfying and specific! Great (and attractive!) solution! I can (sort of) handle the phone charger cords in our tiny house, but the laptop charger cables drive me CRAZY. They just lie all over the floor to be tripped over, and never, ever get put away when not in use. This post gives me hope that maybe one day I’ll find a solution for that too (or maybe you already found one? please say yes!). I keep my computer cable wrapped up in my work bag! Since I work out of the house most days for at least part of the day, that means I never forget it and it’s never snaking across the floor. But! Before kids, when I worked from home most days—and had a second charger at my office for days I was there, I kept it coiled in a wooden wine crate under the couch! Haha maybe I just need to train my boyfriend to actually put his laptop cables (yes cables, there are three, he three work laptops and three cables) away! The bag thing works for me, since I take my charger with me when I leave, but he has separate ones at work so he leaves all his at home, plugged in to the most convenient socket and gets very upset when he comes home and I’ve ‘hidden’ them in a crate or something. Maybe some kind of basket near the preferred plug point could work I guess. Ha! True. If he does the hiding he can’t complain about not knowing where they’re off to! The laptop cord situation got better after the last time I tripped on my husband’s, pulling the laptop off the table and leaving a good dent in the wood floor. Ultimately, I think adding a few update plugs around the house that reflect work better with our work patterns will also help in our old house. Erin, your comment section rules. Always. Also, I love this! My garlic basket currently holds clothespins, and it held my husband’s keys in our old house. A handy little thing. I too am a tidy person and then I married an ADHD man and we had two ADHD kids…and hilarity ensued! and some frustration too. But just like you it’s not the kid’s toys as much as the ugly electronics cords that bug me. Kids toys are a sweet kind of mess; cords on the other hand are, well, bleh. Fifteen years into living with naturally disorganized people, I am a little better at letting messes be sometimes and knowing when I need to shoe everyone out and clean for my own sanity. Not buying a lot of stuff helps too. Thanks so much for being an inspiration on that front. I adore your garlic basket solution. I’ve scavenged a series of flat plastic containers—think they originally held feta cheese–that are just the right size for one coiled charger cable and the associated plug block. Each device gets its own container, the labled-with-masking-tape lid snaps on, and the containers stack into a box that I deemed to pretty to toss into recycling. After too many dead batteries, I’ve instituted a designated charging time (I plug things in while I do my weekly Big Clean on Sunday mornings), so the last thing I clean is that corner, before packing away the cables and enjoying charged devices for most of the week. Best thing about it is I always know where the chargers are: in the box, near the outlet. And if I have to grab one on the way out, I just drop the feta container straight into my bag, knowing I won’t have the wrong one, or the cable but no plug, or whatever. This is really helping me stick to some of my mindful-device-use resolutions. Also, I really think instituting a clean-up time has helped the kids in my life avoid toddler FOMO. I swear, some of them really think I’m playing with the toy cars by myself when they are not around. Easier transitions foreveryone. We all need our little routines, no? I love this idea. It is lovely to look at as well, but I wouldn’t expect anything less from you! I got so tired of moving my cord around the house that I decided to move my desk near an outlet and run an extension cord from it through the back of one of the drawers, turning it into a charging station for my phone & laptop. It turned out quite well! No unsightly cords and its nixed the habit of bringing my phone with me into the bedroom at night. I just turn up the volume and close it in the drawer to charge, works well in a small space where you can still hear it all from any part of the house! Any great phone case recommendations?! It’s made from a mixture of recycled materials as well as naturally occuring Flax straw waste. BPA, Phalates, lead free, comes in minimal (recycled, non-plastic) packaging and is compostable. They also donate to water-based organisations. And currently has free worldwide shipping! Anyway, all baskets are now listed and I’ll keep an eye on them to make sure they stay available. This is so funny and specific, but I love it! I think tiny apartments are better. 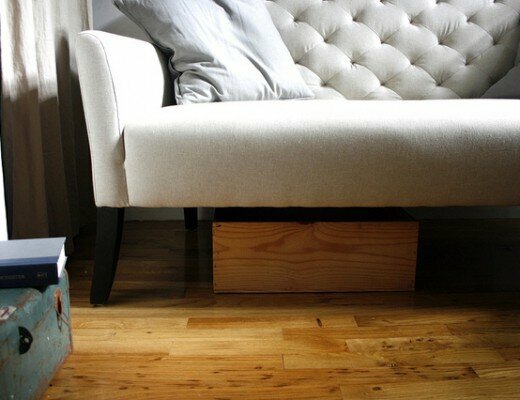 Less space means less cleaning and also keeps you away form storing unused stuff.